& from Scotland including Cwmdu. Every track on Ziggy Stardust & The Siders From Mars sounds like it was pulled from the rock 'n' roll bible. The album created a mythology that reached beyond the Chuck Berry folklorisms of the everyday rocker to create a new type of rockstar. With Ziggy, Bowie created a viable alter-ego to descend onto the planet and wreak havoc on rock's fertile soil and in doing so, he created the most original rock creation since the music's inception 20 years before. 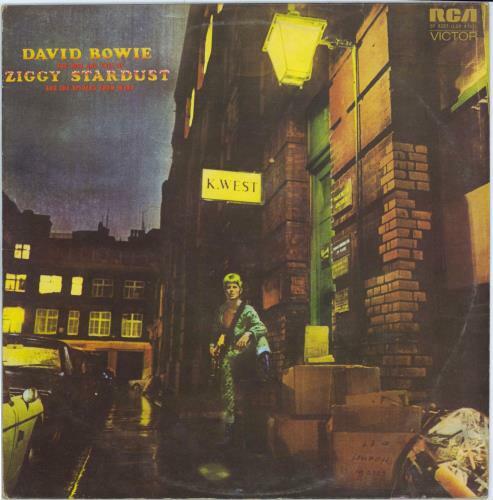 Musically, the album was as inspired as Ziggy's persona. Mick Ronson's snarling guitar evoked the triumphant power of the late '60s guitar heroes, but added a flash so dynamic fans knew why the Spiders were labelled 'glitter rockers'. Product Information David Bowie The Rise And Fall Of Ziggy Stardust - 1st - EX UK vinyl LP album (LP record).